Jalapeño Peppers: Lean In... or Lean Out? Part 1. Lean In... or Lean Out? Part 1. A few days ago I finished Sheryl Sandberg's book Lean In, registering mixed feelings. What follows is a cursory summary of the book (admittedly from a totally subjective angle) and some thoughts on the massively debated subject of balancing work and motherhood. 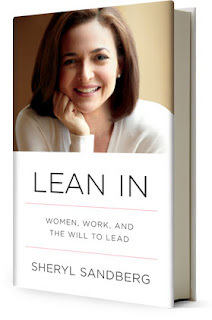 First of all, Sandberg's book is based on a central premise: women have yet to achieve full equality with men, especially in the highest echelons of the professional world, where most CEOs tend to be men. She argues that there are two types of barriers holding women back: internal barriers that women need to overcome in their own minds and behavior, and external barriers that society needs to break down. Within that overall framework, she presents a series of particular recommendations focused mainly on helping women overcome our interior barriers. I personally grouped these recommendations into two categories: helpful highlights and disturbing lowlights. Since there is too much to fit into one blog post, I'll do this in a series of parts. Parts 1 and 2 are mostly helpful "highlights" that made me glad I forked over $25 to Barnes and Noble, while Part 3 will get into some of the more controversial points about combining motherhood with an intensely absorbing, high-powered career. Chapter 1: The Leadership Ambition Gap: What Would You Do if You Weren't Afraid? Just the title of this chapter got me psyched. Yes! I love these types of questions, because one thing that resonates with me is the freedom to define my dreams according to what is in my own heart. Of course, once you have a family, your dreams are joint pursuits worked out in dialogue and teamwork, but they are still yours. Adapted, but still springing from your own heart and arising out of your own reality. For Sandberg, the main obstacle that prevents us from following our dreams is fear. "Fear is at the root of so many of the barriers that women face. Fear of not being liked. Fear of making the wrong choice. Fear of drawing negative attention. Fear of overreaching. Fear of being judged. Fear of failure. And the holy trinity of fear: the fear of being a bad mother/wife/daughter." I was with her until the last sentence, because I think that being a good or a bad mother, wife, and daughter is something with tremendous consequences. Of course, we can sometimes be scrupulous and unnecessarily anxious about whether or not we're doing a good job, and if Sandberg wants women to get over needless worries, then I'm with her. But there are also women who don't give a crap about how many hours their kid languishes in daycare, and I think women like that could use a little more fear in their lives. So what I would answer here is: a woman's self-giving to these relationships is not just some "social construct" that creates a bunch of mental complications and obstacles in her head. Concern about the quality of these relationships is not just a needless fear to be chucked out the window; it's something that has to be evaluated on an individual basis (because we can exaggerate) but always with the awareness that the way we relate to those closest to us is profoundly important and has lasting consequences... especially when a child is involved. I loved this chapter and I thought most of her points were spot on. Sandberg talks about how she and many other women suffer (or in her case, suffered) a confidence problem. When it comes to evaluating their competence or skill, women tend to be harder on themselves than men, more critical of their performance, and more self-deprecating when they talk about their accomplishments. Men, by contrast, tend to be more confident, and are quicker to propose themselves as candidates for new opportunities or promotions at work. They are more comfortable selling themselves and advocating for their own advancement. It's a balance, Sandberg says: "I would not suggest that anyone move beyond feeling confident into arrogance or boastfulness. No one likes that in men or women. But feeling confident -- or pretending that you feel confident -- is necessary to reach for opportunities. It's a cliché, but opportunities are rarely offered; they're seized." She then cites examples from her own professional experience, particularly as a manager of both men and women. Time and time again, men would knock on her door and tell her why they should be promoted, while women were more likely to hang back or take a cautious approach. But by hanging back, we shoot ourselves in the foot. This was a helpful dose of realism for me: "Few managers have the time to carefully consider all the applicants for a job, much less convince more reticent people to apply. And increasingly, opportunities are not well defined but, instead, come from someone jumping in to do something. That something then becomes his job." I loved this. Who better than Sandberg, who worked at Google in the early years and now as COO of Facebook, to know how the job market works these days? I love her spirit of boldness and seizing opportunities that you can grow into instead of passively waiting for the "just right" thing to come along. She mentions the case of a friend who passed up a lot of opportunities during her career because she thought, "That's not what my degree is in" or "I don't know enough about that domain." Sandberg's friend later realized that "In retrospect, at a certain point it's your ability to learn quickly and contribute quickly that matters. [...] There is no perfect fit when you're looking for the next big thing to do. You have to take opportunities and make an opportunity fit for you, rather than the other way around. The ability to learn is the most important quality a leader can have." The ability to learn. The ability to adapt and grow. Making an opportunity fit for you instead of waiting for the world to come to you custom made and in your favorite color. Seize it, make it happen, craft your future, design your dreams. I love it. Sold. Sandberg bases this chapter around the Heidi/Howard study, which took two identical resumes and career narratives -- one belonging to "Heidi" and the other belonging to "Howard"-- and asked students to evaluate which individual they liked better. The students respected Heidi and Howard equally, but viewed Heidi as selfish and "not the type of person you would want to hire or work for." The conclusion drawn from the study is that successful women may sometimes come across as less likable for no other reason than the fact that they are successful. She cites some interesting stats, noting that when graduates from a Carnegie Mellon University MA program started their first job, 57% of the men tried to negotiate a higher starting salary, while only 7% of the women dared to do the same. Sandberg's reaction to that data is fairly realistic: "Instead of blaming women for not negotiating more, we need to recognize that women often have good cause to be reluctant to advocate for their own interests because doing so can easily backfire." 1) "Women must come across as being nice, concerned about others, and 'appropriately female.' When women take a more instrumental approach ('This is what I want and deserve'), people react far more negatively." This part of the solution, then, is for women to take a communal approach, using "we" instead of "I" and speaking of their achievements as gains for the company, not just for themselves. 2) Women must also provide a "legitimate explanation" for the negotiation: for example, a woman asking for a promotion could suggest that a senior figure in the company suggested that she apply, or she could cite industry standards and say, "My understanding is that jobs involving this level of responsibility are compensated in this range." In general, women can avoid becoming the Hated Successful Woman by being consistently nice ("relentlessly pleasant") even if their position requires that they demand results. Sandberg acknowledges that these types of social expectations may be unfair, but she advocates learning to work with that reality until it can be changed, noting that we must also work to change it in the future. What if a woman does all of this and some people still hate her? You can't please everyone, and criticisms will come. According to Arianna Huffington, founder of The Huffington Post, we can't just deny that criticism affects us, because we would only be lying to ourselves. Denial doesn't work. Instead, we should "let ourselves [...] feel whatever anger or sadness being criticized evokes for us. And then we should quickly move on" like a child who cries at one moment and then runs off to play. I would just add there that some criticism is justified, so we should also carefully evaluate what we're doing and see if we need to change some things. All three of those chapters were immensely helpful for me, so I can't wait to share them. Lean In... Or Lean Out? Part 2.